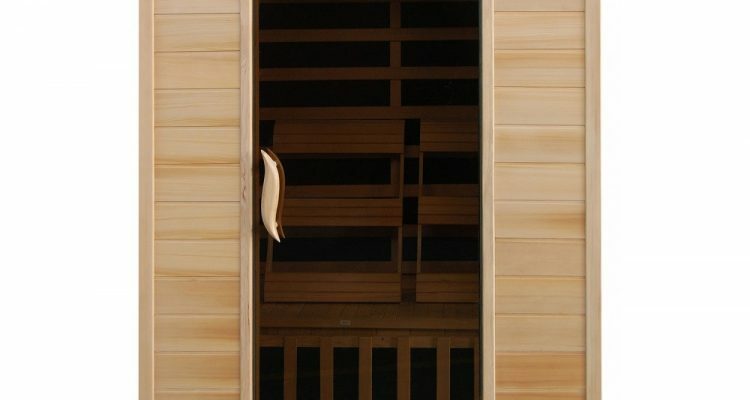 Saunas have long been used for their benefits to the body, and experts like Dr. Walter Crinnion have been advocating its use to induce sweating the healthy way. If you’re thinking of buying a 2 person infrared sauna you may have come across the 2-Person Hemlock Deluxe Infrared Sauna w/ 6 Carbon Heaters. Many consider this one of the top saunas in the market under this category. But before you make a decision, it’s important to know its main features and benefits first. The price is low for what you get and the special features offered by the Hemlock Deluxe Infrared Sauna really sets it apart from the competition. Entertainment System: Available:; CD player, AUX mp3 connection, radio and built-in speakers. Add-ons: Available; towel hook, backrests, color therapy lights, oxygen ionizer, and magazine rack. You can easily control the temperature inside the sauna. It comes with a towel hook, a CD player with MP3, backrests and a magazine rack. It even has an oxygen ionizer and a 7-color light therapy. You’re assured that this sauna won’t break down for a long time. It’s made of solid Hemlock wood that you can set up quickly and easily. The 7 year limited warranty along with 5 years for heating and electronics plus 1 year for radio will give you peace of mind. Is water necessary to create more steam? No. This is an electric type of sauna, which means water is not necessary to produce steam and heat. It utilizes carbon heaters that guarantee even heating inside the unit. 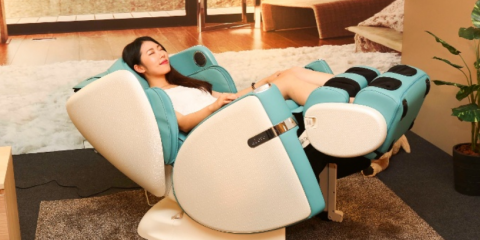 Is this infrared sauna portable? No. It can only be used at home, but dismantling and assembling is easy in case the buyer wants to relocate this unit to other areas of their home. Yes. Its energy consumption is lower than other competitors in the market. Users don’t have to worry about expensive electric bills. No, but a lot of people tend to install them at covered porches. The entire unit is made from solid Hemlock wood, but the warranty said that it’s meant for indoors only. While many users are placing it outdoors, you may not want to risk the unit and the warranty by doing the same thing. Assembly is pretty straightforward, which means the process is completed in a few hours. Some users reported to complete installation within four hours. Can it be installed on different floor types? Yes, it won’t damage carpeted, concrete, wood, and tiled floors, making it a good indoor sauna for every home. However, be sure to wipe your body after going out of the sauna to avoid wetting the carpet after sweating profusely. What is an oxygen ionizer? Oxygen ionizer is a modern technology that purifies the air. Using this model with an ionizer makes a person breathe easier, which is a good relaxing component. The 2-Person Hemlock Deluxe Infrared Sauna w/ 6 Carbon Heaters is best for people who want easy access to infrared heat therapy anytime they need one. Infrared therapy is beneficial for those who want to detox, lose weight, improve blood circulation, and relieve chronic pain. This model is also ideal for those who want a sauna, but don’t have sufficient space at home for building one from scratch. It is compact and will fit in any small area in your home. The manufacturer of this 2 person infrared sauna (Radiant Saunas) offers a 7-year limited warranty for this product. Special warranty details also include 5-year coverage for heating components and one-year warranty for the built-in radio. You can buy this infrared sauna with confidence since the manufacturer is offering replacements or repairs for any factory defects. You will need to contact the seller’s warranty department before returning the unit then prepay the shipment. Consumers must take note that the warranty coverage is only applicable for factory damages. This warranty doesn’t apply on damages caused by improper installation or misuse. Refunds won’t be provided in case a buyer wants to return the product. Another important detail concerning warranty is that this unit is meant for indoors. The company voids the warranty coverage if you set up the sauna outdoors. 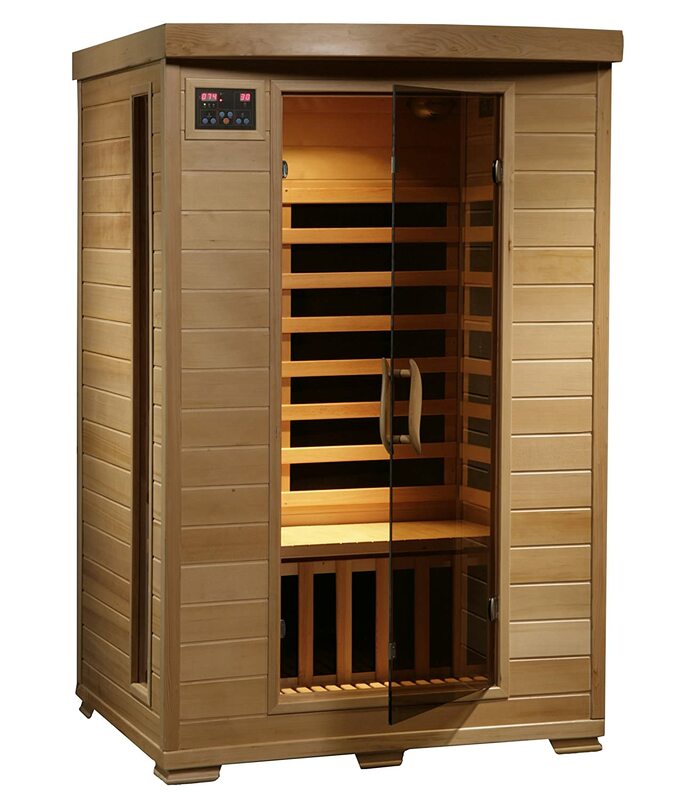 The 2-Person Hemlock Deluxe Infrared Sauna w/ 6 Carbon Heaters is one of the best selling 2 person saunas online. Based on 2 person sauna reviews for this product, we rate this a 4.6 stars out of 5 because it is easy to set up and it works really well for its price. Overall, the 2-Person Hemlock Deluxe Infrared Sauna w/ 6 Carbon Heaters offers numerous advantages and features that make it an excellent option for anyone looking to buy a 2-person sauna for home use. It’s made from durable materials, it comes with some add-ons, operates with six carbon heaters, and its LED controls are also scratch resistant. However, it’s also important to know that this sauna has received some complaints regarding its maximum temperatures. Personally, I think this is a matter of preference. Some people prefer their sauna experience to be really hot but others have no issues with the high temperatures that the Hemlock Deluxe can reach. If you want a beautiful and classy looking sauna that can easily drive compliments from your visitors, then I highly recommend this product. Many consider it the best 2 person infrared sauna because of its impressive features and design, and I tend to agree. Imagine being able to listen to soothing music while getting a relaxing sauna just like being in a spa. With all its nice features, you definitely get more bang for your buck when you choose the 2-person Hemlock Deluxe.